LONDON'S legacy Olympic Park could become the testing ground for electric driverless cars, which experts believe could be commonplace by the 2030s. The EN-V - electric networked vehicle - produced by General Motors could help to make the Olympic Park in Stratford, East London, carbon-free in transportation terms. It is the closest the industry has come to cars driven by artificial intelligence. Driven by next-generation satellite navigation and v2v - vehicle-to-vehicle wireless connectivity with other cars - and carrying an array of built-in sensors, GM claims that the EN-V concept makes collisions impossible, renders traffic lights redundant and, running on an electric charge, eliminates urban congestion and pollution. They can even take children to school and park themselves. 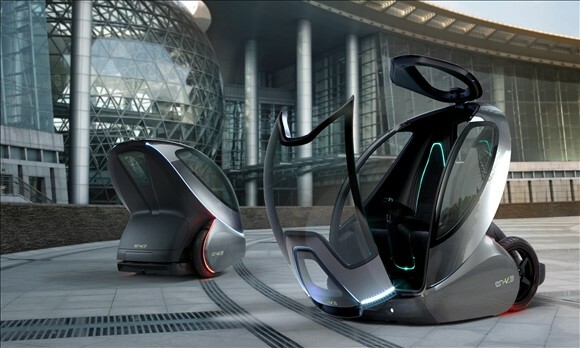 The concept car, developed by GM's Michigan-based British scientist Chris Borroni-Bird, was targeted originally at the cities of the future, such as those being developed in China and the Far East. Mr Borroni-Bird has also considered their use for closed communities such as those for the elderly or for sprawling student or commercial campuses. However, GM has approached the offices of the Mayor of London Boris Johnson and of the Olympic Park Legacy Company, offering the EN-V as the ideal mode of transport when the area is transformed from 2013 into the Queen Elizabeth Olympic Park. GM said: "The EN-V has the capability of being the Boris bike of the future." The legacy Olympic Park envisages 11,000 homes plus businesses being built in five communities connected by nine miles of roads and twenty-two miles of cycle and footpaths. The Olympic Park Legacy Company said that no decisions had been made on transportation but that it "would be keen to support and hugely encourage sustainable schemes". Working models of the EN-V have been in Britain for the first time over the past week. Showcased at last weekend's Goodwood Festival of Speed, the vehicles were also put through their paces at GM's testing grounds at Millbrook in Bedfordshire. GM has been calling the project the "reinvention of the automobile". Tom Brown, project engineer on the EN-V programme and the vehicle's chief test driver, told The Times: "The EN-V means you have to rethink everything you think about cars and about traffic." He said that the futuristic design of the EN-Vs - drawn to appeal to the Chinese market - had prompted several offers from wealthy car enthusiasts at Goodwood. GM created the EN-V for the Shanghai Expo as a solution to expected population shifts in the coming decades. It is said that by 2030, 60 per cent of people will be living in urbanised areas. A recent White Paper from the European Commission proposed the abolition of anything other than electric cars from urban areas by 2050.